They both weigh between 28 to 30 pounds. One has thick, black fur and likes to run around a lot, and her half sister has brown and white fur and likes to run around even more. If you’ve been to the Zoo lately, you already know we’re talking about alpacas, Sarita, born August 1, 2013, to mom, Marcella, and Arica, born August 17, to mom, Eleanor. The newborns share an interesting lineage since Phoenix is dad to both babies, and Eleanor (Arica’s mom), is also Marcella’s mom – that makes Eleanor, Sarita’s grandmother! The name Sarita has Spanish origins and means “princess.” Arica was named after the northern Chile city of Arica – her name was chosen by a Zoological Society of Milwaukee, Zoo Ball auction winner. Both Sarita and Arica are still nursing from their moms, and will continue to nurse for about three months. They will start sampling hay, grass and pellets soon. Please visit Arica and Sarita at the South American Exhibit. Captive alpacas are usually born on exhibit during the daytime, because they cannot extend their tongues to clean off newborns. Births occur during the day when it is warm enough for babies to dry out on their own. 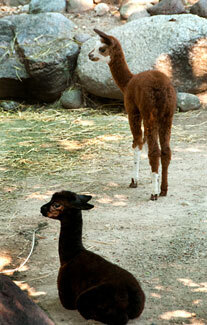 Alpaca are members of the camel family and are native to the Andes Mountains of Bolivia, Chile and Peru. In the wild, alpacas live in altitudes of 12,000 feet. Their thick fur keeps them warm.